When you hear the words "Ark of the Covenant" what comes to mind? For some, Steven Spielberg’s film "Indiana Jones and the Raiders of the Lost Ark" provides the most vivid pop-culture reference to this mysterious sacred object. "Different people will give you different answers to that question," said Baruch Halpern, Penn State professor of ancient history, classics and ancient Mediterranean studies, and religious studies. "The Ark is a regular feature in the Old Testament, making several appearances in the first five books of the Bible. There are many consistent references to the Ark, and when you add it all up, it seems like the Ark was a real article." According to scriptural accounts, Halpern said, the Ark is a box made from acacia wood, covered in gold and used as a container for the stone blocks bearing the Ten Commandments. Said to have been built at God’s command, the Ark is believed to measure about 4 feet by 2 feet by 2.5 feet and features gold rings on the two long sides that hold the wooden poles used to carry it. 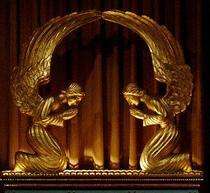 The top surface of the Ark is decorated with two cherubim, or angels, who crouch facing each other with wings outstretched, forming a seat. Believers say God himself occupies that seat, while the Ark served as a footstool, Halpern said. There are references in other ancient texts of similar "containers" used to transport sacred relics, and the image of God sitting on the wings of cherubim with his feet resting on the Ark below fits with depictions of ancient kings, he said. "It’s also important to note that it wasn’t just the Ark being carried into battle. YHWH, the name accorded the god of Israel in much of the Bible and later literature, accompanies the Ark into battle, giving it miraculous power," Halpern said. There are many references to the awesome power of the Ark, he said. Various Bible stories describe how, during the exodus of the Israelites, the power of the Ark parted the river Jordan to allowing the people to pass. During the siege of Jericho, the Ark was toted around the city walls in a seven day procession accompanied by seven priests sounding seven trumpets - and made the city walls come tumbling down. The ferocity of the Ark was so great that it had to be covered by a veil while being carried around, and could bring misfortune and tragedy on those who disrespected it. Despite the powers it was said to possess, the Ark was eventually lost to the sands of time. The last Biblical mention of the Ark comes when the Babylonians destroyed Jerusalem and plundered the temple where the Ark was stored, Halpern said. After this point, the fate of the Ark is the subject of much speculation. One theory is that the Ark was captured by an Egyptian pharaoh, a tale that gave rise to the Raiders of the Lost Ark movie plot. Another possibility is that the Ark was hidden by priests under the Temple Mount for safekeeping, or spirited away to an unknown site before the Babylonians even arrived in Jerusalem. Other suggestions are that the Ark was removed by divine intervention, taken by an Ethiopian prince, or destroyed in battle. "They’re all fantasy, and we’ll never really know which one is true," Halpern said. "Some theories seem more plausible than others. Was the Ark hidden from the Babylonians? Unlikely. Did the Babylonians take it? That theory is more probable." Like Indiana Jones, some real-life scholar-adventurers are on the trail of the Ark, with one researcher claiming to have found the remnants of the Ark stored in a library in Zimbabwe. Could this be true? In some ways, the story of the Ark is similar to other Judeo-Christian religious relics such as the Shroud of Turin and Noah’s Ark, Halpern said. "You have to remember why this scripture was written in the first place, and see the Ark’s symbolic power to people as a sacred object. If you try to over-explain it, you lose the power of the story." The Ark, a sacred Box, was a common religious artefact of the Middle Bronze for all the cultures of the Levant. Would be very odd if the Israelites didn't have one if they arose in the Middle Bronze - and very odd if they did have one and arose later. Of course archeology is science. Typical 'atheist' arrogance to call it 'myth', even if much of the Tanakh is 'myth' and legend. But the job of historical research, via the scientific method, is disentangling the threads of historical fact, mythical tale-spinning and contemporaneous tendentious reportage. And the Ark is, as Baruch Halpern rightly emphasises, well-attested as a real object. When dealing with any topic of importance in the sciences the first thing a person should do is throw all Hollywood nonsense into the trash. Hollywood debases and insults everything and should never be invoked in any academic or scientific discussion. Other opinions may vary. "The Ethiopian Orthodox Church claims to possess the Ark of the Covenant" (Wikipedia, under "ark of the covenant") The case made by the Ethiopian Orthodox Church is surprisingly detailed and believable. If nothing else, it is fun research. However, if, as they claim, they will reveal the ark when the time is right, its discovery will be earth-shattering. Or at least it will shatter the claims of the higher critics who suggest that nothing of Jewish history is particularly valid prior to King Josiah. Could we ever come to believe there exists an intelligence greater than our own? We should do that some day, as it does follow the natural order of things. Darwinian or otherwise. As an example the potentials within the intelligence of the cetaceans. Are they merely of a different type of intelligence? Our internalization of manipulable digits as forming our own orientation and basis, and thus our forming of test protocols for testing their intelligence could be severely coloring any test regimen from it's very origins. The idea of 'cognitive function' being solely and specifically a human orientation and polarization or the sole vector describing intelligence is patently absurd when viewed with clear eyes,and thus we may be dismissing the intelligence of the cetaceans as we don't even know how to test them, they being with differing foundations. It is a difficult and complex question at best and curtailing human emotions in the musing is key. Since most ppl believe they know everything ,,,I'd say no! It just makes them lose their smugness at being the all-knowing. Nice article, I enjoy religious history. Sadly the picture depicts _our_ understanding of cherubim and not the historical one. Many archeological sites in the Middle East have cherubim guarding doors or passages. They are lions with wings and human heads. Why didn't this article get posted in every science magazine from scientific american to 'Science' nad 'Nature' and posted on websites like this? Why don't we talk about "The Bible Unearthed" even though it actually didn't bring up anything new to those who new about that stuff for decades before that books publishing? I'll tell you why! Because America(and really the world will become in due time) is the Roman empire; each American school really, much less than just the universities, are the city of alexandria. That's clue enough to what I'm pointing at for anybody who's watched Carl Sagan's "Cosmos"(or read it). bfast, the Eastern Orthodox Church claims to have pieces of the One True Cross. I just saw a video on NASA TV with prelaunch preparations for a launch to the ISS. A priest was there, gave the cosmonaut a silver cross containing a sliver. I wasn't speaking to anyone at the time, but if I had been, I'd have been speechless. The search for these illusive relics, it seems to me, doesn't contribute either to religion, or to science, or to archeology. If one day they are found, great. In the meantime the speculation that goes on is nothing better than tabloid sensationalism. It would be funny -- at least to me -- if the ark was indeed preserved and intact -- inside of a hidden room in the sphinx, after all the sphix is in the shape of a cherubim. This is more of an encyclopedia article that news. If the rings for carrying it were gold the thing couldn't have been very heavy could it? How thin could they have made the wood? Would a gold alloy need to be very thick to support a big wooden box and stone tablets (not to mention the weight of God's feet and the angels supporting his backside)? Did anyone spot that the illustration didn't match the description? It says that the cherubims wings form a seat and that god sat on the wings and used the ark as a foot stool. So the wings should extend forwards (horizontally) as if the cherubims were reaching out to each other. I seem to remember egyptian figures in this pose. The old testament stories do not have more or less historical weight than, say, the Iliad, another bronze-age story with a historical event intermingled with stories about divine entities. Of course there was some moveable box with various religious artefacts -it is just a large-scale version of amulets and other religiously charged icons. Of course it was looted by the Babylonians, along with any similar religious artefacts from other conquered nations in the region. It would either have been broken up for the gold and silver, or looted in turn by the Persians. If it survived that, it would have been looted again by Alexander's greek troops and the gold melted down to finance the endless wars between the various hellenistic rulers.